It began as a normal Friday evening - sitting on the couch sleeping in front of an active TV show that we did not want to miss. All of a sudden Taffy the Pom and Joy the Border collie began to bark. The unmistakable pitter patter of “Mollie feet” raced thru the inner rooms and into the living room. “Mollie, get out of here and get back to the kitchen.” Usually that elicits another running response as our wayward corgi races back to the kitchen. This time there was no sound. I rose from the couch carefully to not disturb Jim, took a flashlight and went to the kitchen. The door was still closed and 4 lovely doggie faces stared back at me- Not a good sign! Some guard dogs the four of them were- the creature had come thru their fenced yard thru a doggie door to the outer room and then thru a second doggie door into the mud room. Apparently it made too much noise going thru the kitchen and woke them from their beauty sleep! I woke Jim and let Taffy and Joy into the area to seek out the invader (thinking it was merely a squirrel or chipmunk of which we have abundance). The intruder was located behind the book case and under the stair landing- the one and only place measuring 6” by 36” with the wall interior exposed. Great- now we’ll need to get a squirrel out of the insulation. 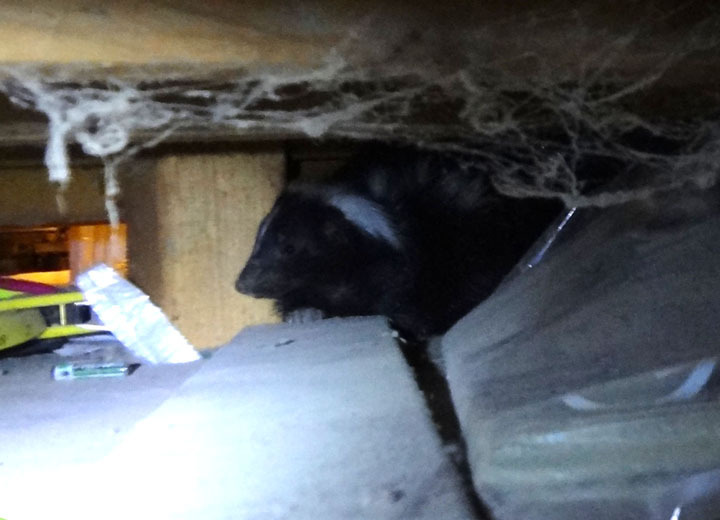 But alas, when we flashed the light beneath the platform, 2 small black eyes and a fluffy head with a white stripe parting a black face peered out- yep a skunk has violated our privacy. Sunday night around 10 PM the dogs stated barking again and we thought- no, not again- the mouse trap snapped (yea caught a mouse- it’s that time of year) - and all was quiet for 10 minutes- then the scratching began. 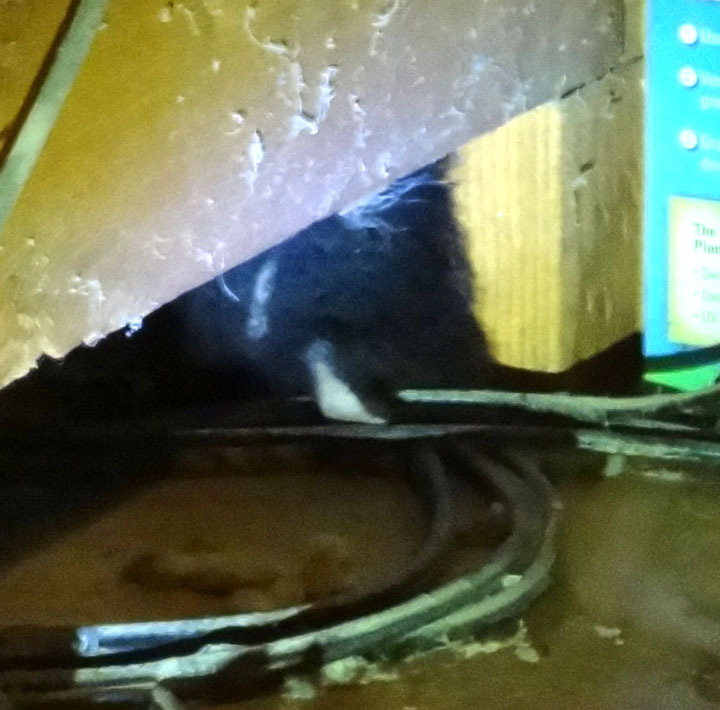 Peering under the stair well- 2 little back eyes accompanied by a black furry head parted by a white strip peered back. Apparently, our new pet had not left. We set a have-a-heart trap using cat food and created the road to freedom with a food trail to escape. The next morning, the powdered flour at the door showed no passage, but the cat food and water were gone. 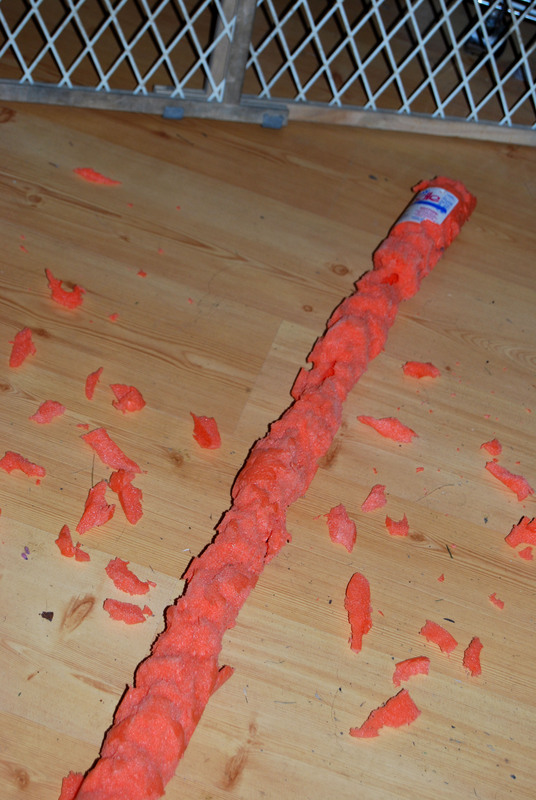 The next evening, Jim tied the cat food can to the trap trigger and again made the trail to freedom. Again our little friend was cleaver enough to eat without setting off the trap. The next night we flooded the area with light, brought in an 8” diameter sluice pipe as well as set the trap. Again- no foot prints in the flour. Unfortunately we had run out of time- we needed to leave for an agility show Thurs and would not be back until Sunday evening. We left food and water for her and used our Xpens to confine her to a limited area (we thought). On Sunday evening when we returned home we noticed a few items were moved from when we left, A stirafoam “noodle” was chewed up and all the cat food gone. Jim took the high energy light and began the search. After a short time he discovered her behind a cabinet that was next to his desk. She had breached the xpen walls and gone exploring. OK, we really had to end Penelope’s great adventure so life could return to a semblance of normal (whatever that is). Again Jim rearranged the pens, set 2 havaheart traps using bacon (a DEC expert that we spoke to at the dog show suggested bacon as a skunk’s favorite food), set the corridor to freedom, sprinkled down the flour for footprints (we hoped) and added a small surveillance camera near the door. Once in the RV, I turned the volume up on the camera and heard the soft melodic sounds of our wind chimes on the porch. Around 10:30PM one of the dogs barked and a metallic sound could be heard on the monitor. - Penelope had entered the second trap and sprung it- Praise the LORD!! Carefully we entered the house. Penelope was staring at us behind bars. Jim covered the trap with a larger covering, picked it up and took it up behind the barn and released Penelope. She did not leave until she finished off the cat food then meandered out - hopefully not to return to the house later (although I’m sure she found our hospitality and food very agreeable). Jim lined the dog kennel with smaller fencing to prevent the previously easy access thru the 4X4 inch openings in the surrounding dog yard area. Penelope’s great adventure had ended (we hope) with no real damage or discomfort to anyone. The outcome was a repair to the wall- no more exposed inner wall and the dust-webs were cleared out. The dogs have been advised to stop inviting their woodland friends in.